Get big bass sound in this updated take on an industry standard. 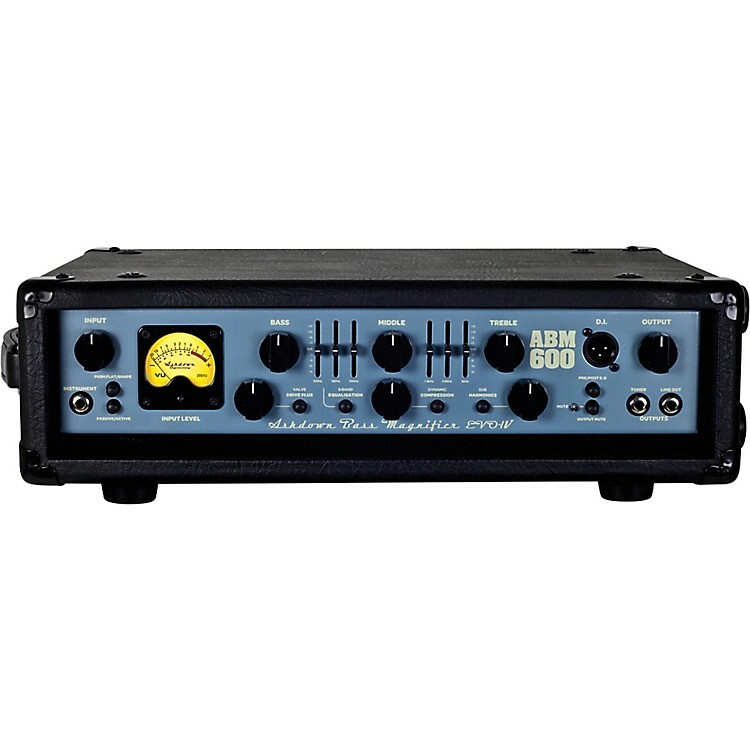 Immediately identifiable on stages around the world thanks to its glowing VU meter, the Ashdown ABM has become the industry standard for bass players for over 20 years. Now in its fifth incarnation, ABM EVO IV pairs class-leading preamp sophistication with uprated powerhouse performance and a 9-band EQ. The ABM 600 EVO IV teams the ABM preamp with a gut-rumbling 600W power stage. Our Variable Valve Drive preamp section has also been upgraded in EVO IV. Delivering more current to the 12AX7 tube enables more drive and harmonic content than ever before, enabling players to dial in a sound from pristine clean, to the fattest, fullest bass overdrive currently available. The Drive level can be preset and kicked in and out via footswitch, providing access to a huge range of clean, warm and overdriven tones. Bassists plugging into EVO IV will be greeted straight away by the flickering of the new Input VU meter, allowing them to quickly find the sweet spot for their instrument. From there, EVO IV features a sophisticated 9-band EQ, with familiar Bass, Middle and Treble controls and six sliders providing precision cut and boost at 100Hz, 180Hz, 340Hz, 1.3KHz, 2.6KHz and 5KHz. The EQ can be switched in via footswitch taking the player from a flat fretless sound to their favorite EQ setting instantly. The NEW 9-band EQ is a revelation of sonic perfection and will surprise older ABM users. Other ABM favorite features are retained in EVO IV, including Ashdown’s famous One Knob Dynamic Compressor sub octave note for huge bass tones. Kick it in and this simple to use, great sounding compressor delivers a powerful, even sound, guaranteed to help your bass fill out any mix. Once heard – never forgotten. The ABM Sub-Harmonic generator adds an octave below the notes being played bringing fullness to any bass part. The Sub level is independently controllable, letting you dial in anything from a subtle hint of deep bass to a full-on subterranean funk. Not that you'd expect any less, ABM is loaded with connectivity. A tuner output, Line out, transparent FX loop and a Line Input for the connection of an external sampler or sound source. Output muting cuts the signal from the DI output but leaves the tuner output 'live', allowing the player to tune up in silence. Paired with our FS-4 footswitch (not included) the ABM comes alive for onstage use, enabling on-the-fly tonal gearshifts. With footswitchable Valve Drive, Compression, EQ and Sub Harmonic Generator, ABM puts dozens of sound combinations at your feet, without so much as an effect pedal in sight. Dimensions: 5.31" x 18.66" x 12.6"